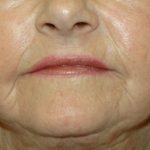 This patient underwent a nostril sill lift combined with lip augmentation with Radiesse. 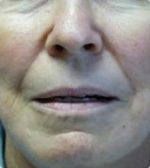 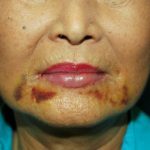 Notice the diminished length of her philtral column (just above her upper lip) resulting in a more youthful appearance. 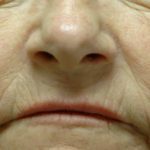 Despite multiple soft tissue augmentations of the marionette lines, this patient was still unhappy with her appearance. 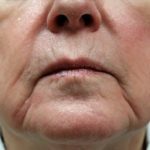 She underwent a direct excision of her marionette lines which involves surgical removal of the actual wrinkle. 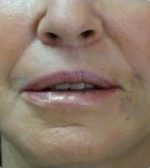 This patient underwent soft tissue augmentation of her upper lip along with a corner lip lift. 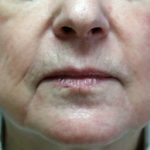 Botox may also be used for non surgical lifting of the corner of the mouth. 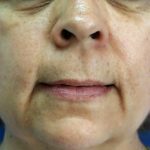 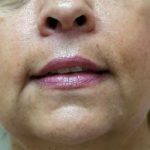 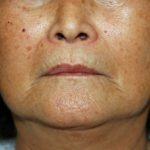 Direct lower lip lift 5 days following surgery.